Thatta Payir Puli Kuzhambu is a popular dish in Tamil Nadu. 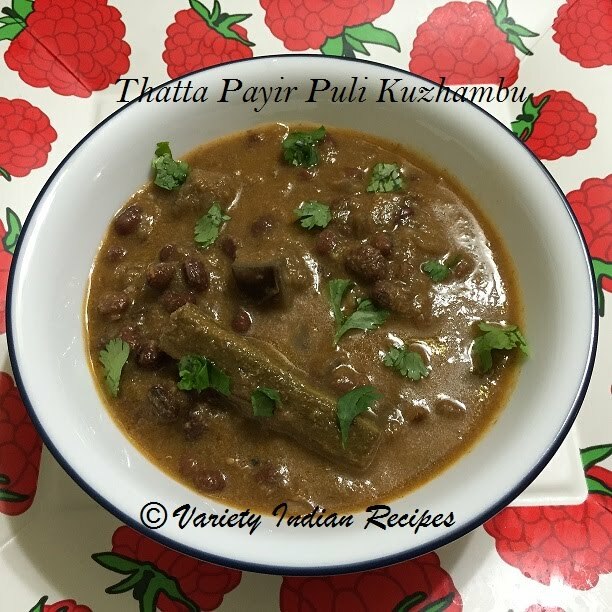 Thatta Payir (Cowpeas) provide a rich source of proteins and calories, as well as minerals and vitamins. This gravy goes well with rice as well as idly and dosa too. Pour Oil in a pan, roast red chillies,onions. Saute till onions are translucent , add tomatoes and saute until the tomatoes are soft. Cool the above roasted ingredients and grind them with grated coconut. Rinse and soak Thatta payir(cowpea) in water for 2 hours. Pressure cook it with water adding a little salt and set aside. Now add onions and garlic, fry till the onions become translucent. Add the vegetables drumstick and brinjal and saute for 2 minutes. Add the cooked Thatta payir(cowpea) and stir well. Add the grounded paste (paste containing onion , tomato and coconut) and stir well. Add coriander powder and mix well. Allow to cook for 2 minutes. Now add the tamarind juice, and allow to boil until oil separates. Now tasty Thatta Payir Puli Kuzhambu is ready.